I know, I know, the Brooks Asteria has been out for a couple of years….but it hasn’t changed yet and it is a shoe that has many features that many people will like. It was almost a year ago when my colleague Matt gave a short review of this shoe (only one or two runs in the shoe). 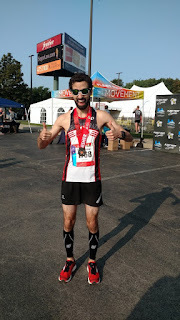 Here I will dive in with a full review and give you all the nitty gritty details about this uptempo/racer from Brooks Running. So Brooks has really started to step up their game in the looks department. Gone are the days of 80’s looking shoes/shoes that you see your dad or uncle wearing at the family BBQ on memorial weekend. Instead Brooks has given this shoe a modern look with a sleek design, vibrant colors, and the most comfortable upper you will ever have against your foot. I really am digging the Red colorway (I just wish I could get the orange in the Men’s). Seriously, the upper is amazing…but how Nathaniel?! Well, for one, the upper has 3D [printed overlays giving a seamless feel on the top of the foot. The upper even has a full length Cushsole S-257® (found in some of Brook’s softer running shoes) and this only adds to the luxurious feel of the shoe, which is further enhanced with a sock liner made of BioMoGo® foam sock liner. There is also a generous amount of space for your toes, not cavernous though as the foot is held firmly by the narrow running forefoot and heel. This is how a shoe should fit in my opinion, very snug in the heel and midfoot and space for your toes to expand and move around. Speaking of the heel, the heel hold is phenomenal (one of the best I have experienced thus far in a running shoe). There is a heel counter, which is fairly stiff (people with sensitivity in the Achilles and heel be forewarned). This set up works wonderfully for an individual like me, who has extra mobility of the rear half of the foot. Honestly, Brooks didn’t skimp out on comfort! This is quite the opposite one expects from a racing flat. I have one aspect of the upper that I dislike, but I’ll get to that at the end of this review. Oh, and this shoe fits true to size. A very sleek modern looking shoe. I love this colorway, but the yellow and black isn't bad either. One can also see the utilization of full length BioMoGo DNA midsole and nice flew grooves in the forefoot. 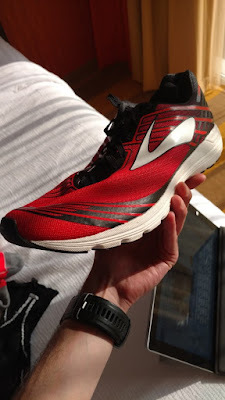 If you have read my review of the Hyperion, then this shoe will have some very similar midsole feel and technology (Hyperion Review Here). Just like the Hyperion, the Asteria has a full length BioMoGo DNA midsole, which is a combination of Brook’s BioMoGo and DNA Cushioning technology. I really enjoy this midsole material, as it feels softer at comfortable paces and really responds when you pick up the pace. This shoe can be viewed as the stability version of the Hyperion, but in a way it is its own shoe. The Asteria has a better designed outsole, which is full contact and has an overall wider platform (i.e. more stable) to push off from. Furthermore, the transition is much smoother then the Hyperion and I feel this is due to the transition zone in the midfoot, correctly places flex grooves in the forefoot only, and with the use of Guide Rails in the rear foot. I know Matt touched on these in his Preview of this shoe (HERE), but I will go in a little bit more detail and let him throw in his two cents. The Guide Rails work in a more organic means to guide the foot through the gait cycle. The heel is set up with higher durometer (firmer) midsole material along the medial side along the perimeter of the shoe and is horse shoe shaped, with a small amount of this denser foam on the lateral side (see picture below). This configuration helps guide the heel into a path of least resistant and is what gives this shoe such a smooth feel through the gait cycle. Therefore, even if you are a completely neutral runner, I think one would appreciate the extra stability….especially in a long distance race (which is what this shoe is intended for). The last point I want to address is the propulsion pods, which like the Hyperion, give a very nice trampoline like effect at toe off. Overall this shoe has a firm ride, which works synergistically with the other stability elements I have already mentioned and contributes to its fast feel. Thoughts as a DPT (Dr. Klein): As I mentioned in my initial review, the Brooks Asteria is one of the few running shoes out there that has both medial and lateral rearfoot posting. Most companies only post the medial aspect of the foot, which only accounts for those who overpronate (and this doesn't always affect or help those who do over pronate or have uncontrolled subtalar eversion). I must first be clear that pronation of the foot is very normal and important for normal shock absorption. Overpronation is a bit of an arbitrary term and I prefer the term excessive mobility, because that leaves thing a bit more open to focus on specific joints and how them may affect global motions. 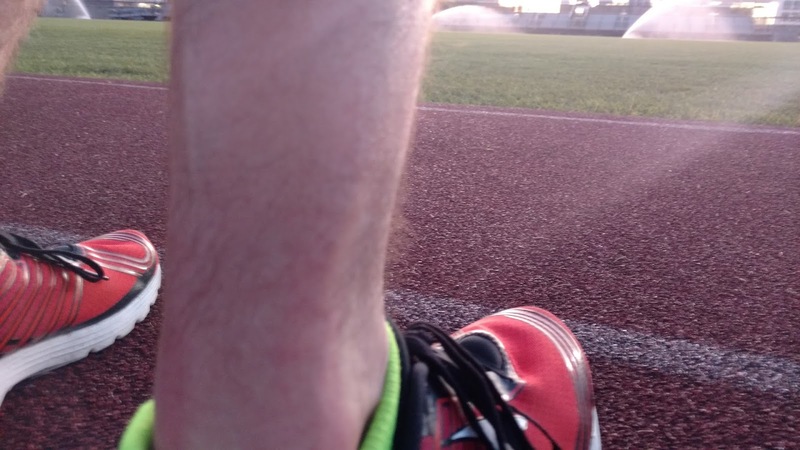 Dr. Kollias has a bit of extra mobility in his calcaneus, which can set him up for a bit of an unstable landing as a light heel/midfoot striker. He is VERY light on his feet (which is why he gets so many miles out of his shoes), however that instability can get to him a bit of trouble. This shows up for him as knee pain as his quadriceps attempts to stabilize his knee on the somewhat unstable base he is landing on. This is further confounded by some gluteal issues, which he is working on and having a great deal of success with in terms of strength, stability and speed. The mobility and position of the heel bone can dictate a great deal of what happens farther down into the forefoot. Instability there can by compensated for elsewhere, which usually means wasted energy that could be used for propulsion. In Dr. Kollias's cases, the rearfoot stability provided by the posting, or "guide rails" serves to guide him nicely forward without influencing anything in his forefoot (which is stiff... and you don't want additional posting where someone is stiff). This is what stability should do. Guide you, not force you in a direction. The Asteria, although I love it, does not work for me because my calcaneus is stiff and my extra mobility occurs at my forefoot. Which is why forefoot stabilized shoes like the Skechers Forza 3 (REVIEW) work very well. So as always, you need to find the shoe that works for you. Some people may need some additional stability back at the heel. Others who do not even make contact there will love it for the very neutral forefoot ride. One can appreciate the firmer midsole material on the medial aspect of the heel. This is part of the rear foot guide rail system. This is horse shoe shaped, with a larger amount of this higher durometer material on the medial side and decreasing as it wraps around the heel to the lateral aspect of the heel. These guide rails paired with the stiff heel counter and secure midfoot hold all add up to a very stable racer! These shoes are holding up wonderfully. After running over 100 miles in them, I see little to no wear. Also the midsole material hasn’t lost any of its springiness and I contribute this to the blown rubber on the outsole and the composition of BioMoGo and DNA. I see myself easily getting 400 miles out of these shoes. The laces, dear lord the laces! They are so long on these shoes. I really don’t understand why and I don’t like the thinness/elasticity of them. I feel that if Brooks took the laces from the Ravenna 9 and placed them on this shoe it would make for easier lacing. The only thing I want Brooks to try out is adding a thin layer and/or incorporating their new DNA AMP midsole material into this shoe. I am curious about the DNA AMP, because on cold weather runs here in Up State New York, the cold weather tends to really firm up the midsole material (a downside of EVA based foams). By no means a deal breaker though. If you are in the market for a racing shoe and need stability, look no further! The Asteria is a superb shoe that will not only compliment your biomechanics, but will keep your feet protected and moving fast on race day from 1/2 marathons and up. Also, the high durability and acceptable price of around 100 bucks makes me wonder why one would reach for anything else. It is very hard to find stability shoes that are light weight and even rarer to find stability racers. I highly recommend you try them out! Editor's Note: As always, the views presented on this website belong to Dr. Klein, Dr. Kollias or the selected few who contribute to these posts. This website should not and does not serve as a replacement for seeking medical care. If you are currently injured or concerned about an injury, please see your local running physical therapist. If you are in the Los Angeles area, Dr. Klein is currently taking clients for running evaluations. ***Disclaimer: These shoes were a personal purchase from Brooks Running. 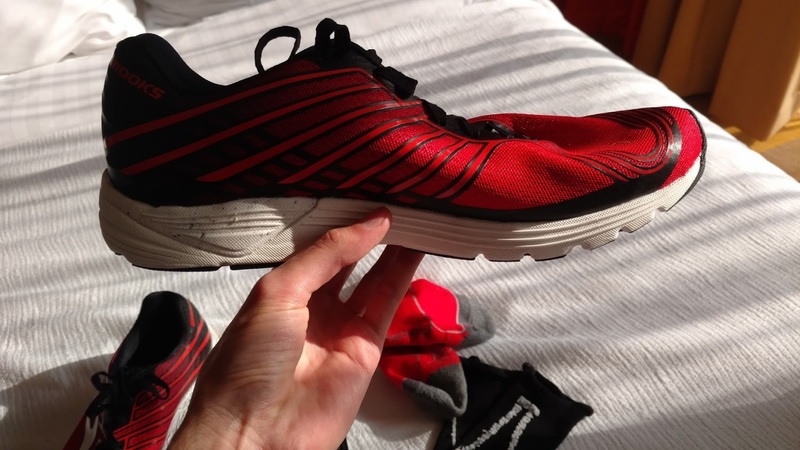 We put at least 50-75 miles on trainers and 25 miles on racing flats prior to reviewing them. Currently Dr. Kollias has 130 miles on his pair in a variety of conditions. If you are a footwear rep looking for footwear reviews or consultations on development, we are currently looking to partner with companies to assist, discuss and promote footwear models. Partnership will not affect the honesty of our reviews.